IGCSE from Cambridge International Examinations ( CIE) is recognised as a Class X examination by all Indian national and state boards. Cambridge A level is recognised as being equivalent to any national Class XII examination. And acceptance of these two curriculums is increasing in India has increased as parents now want their children to opt out of the race for marks option present in traditional education systems. Many international universities prefer students trained in the thinking style of education. International programmes give students an edge during the college admission process. Additionally, most universities in North America give credit for subjects taken at the A levels, giving students the benefit of saving one semester or more at the university. This translates into saving substantial money and time in tuition and accommodation costs. Some Universities in UK such as Oxford, Cambridge, London School of Economics, Imperial College London and University College of London only accept students with Cambridge A level qualifications. University admissions around the world are getting competitive by the day. Admission officers are increasingly looking for other evidence that a student will succeed in the university, such as exposure to quality curriculum, research abilities, international outlook and social service - all enhanced by Cambridge. IGCSE and A level programmes are more practical and application-based and have a broader spectrum of subjects that lead to all-round development and are more challenging than Indian educational boards and test student knowledge, not their memory and speed. Cambridge AS & A Levels is universally reputed for rigorous assessment. This gives students access to the top colleges and universities in India and the world. In IB and Cambridge A levels, the focus is on the all round development rather than pure academic performance. How is Manchester International School different from the already existing International schools? It ensures openness, celebrates diversity and creates a multicultural learning community. Manchester is the green school by practice and 80% of the campus is green and only 20% is built up. It emphasizes the process of, and meaningful learning rather than just passing the examination simply. It’s Founders, Faculty and Staff members represent diverse backgrounds, cultures and nationalities provides a strong English Language programme. The university placement programme at (MIS) has an impressive track record, as graduating students have received offers from, year after year. Can students get into an Indian Education System after grade 10 and into an Indian University after grade 12? Yes, they definitely can. Students who decide to study in India can get admissions into Indian Universities because both the Cambridge IGCSE and the AS & A Levels are recognized by the Association of Indian Universities. In the context of globalization, increasing numbers of students want to go overseas. So the Cambridge IGCSE and AS & A Levels makes this transition easier. A careers and guidance counselor will ensure that each child is adequately guided through the process of finding the right college and university on completing school at Manchester. How different is the teaching Methodology at Manchester International School ? The strategy and methodology used at Manchester will maintain the delicate balance which holds together classroom learning, experiential learning, problem/project-based learning, and a discriminate use of technology in the classroom. Children will learn from their peers as well as from the teachers who are the initiators and facilitators in the learning process. The school will provide opportunities for, and support individual potential and creativity and ensure a whole-brain curriculum. Other than academics, what are the things my child can aspire to learn? Other than academics, students will learn to apply knowledge meaningfully to real life situations, become open-minded enquirers, balanced and responsible persons, critical yet, principled and reflective thinkers, effective communicators, responsible risk-takers and caring individuals. How good are the infrastructure and other facilities at Manchester International School? 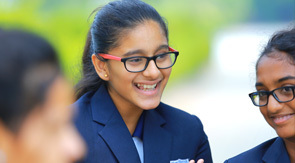 Manchester International School’s infrastructure is adequate for delivering a meaningful and effective education and meets international standards in all aspects whether it is academic, residential or co-curricular facilities. As the physical environment of a school greatly impacts or impedes learning, Manchester has invested in internationally accepted educational facilities. What are the programmes that the school initiates to foster leadership qualities in students? The school conducts elections at the school and class levels and students are involved in the process of selecting their leaders. The Interact Club- The Student wing of the Rotary Club - is another platform for honing these skills. We process electronic / online payments by credit or debit cards, bank transfers ( NEFT) through our secured payment gateway linked with our parent portal. We also offer scope for cash/ cq/ payment through all branches of our banker.